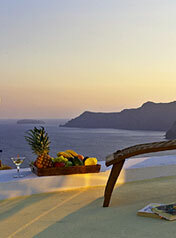 Situated in the heart of Oia the BEST WESTERN MUSEUM SPA WELLNESS HOTEL is a delightful heaven which will satisfy even the most discerning of guests. 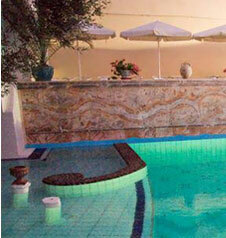 It has been tastefully refurnished and is now a hotel to suit the tastes of demanding guests. The work of prominent artists, combined with the excellent furniture and fittings further enhance the hotel's aesthetic beauty. 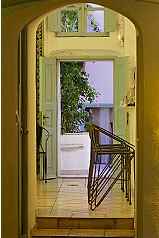 Every step has been taken to ensure the guests' utmost satisfaction. Room Availability & Online Booking ! 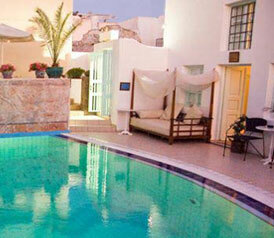 The Best Western Museum Spa Wellness Hotel in Oia is housed in a gracious red stucco restored mansion. 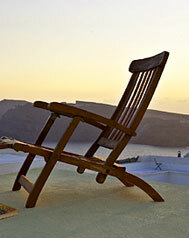 Steeped in old world atmosphere, this luxury hotel stands over the main shopping street in Oia, next to the Caldera . Well worth a visit in Oia is the Venetian castle, the Art Deco galleries, cafes, tavernas, boutiques & gold shops, as well as Ammoudi Harbour with its Fish Restaurants. For a small fee, you can enjoy our Museum Hotel Spa service benefits. Your stay in Museum Hotel won't be complete until you have experienced the relaxing, soothing touch of a massage, facial, or one of our many therapeutic services at Volcanic Spa. All the suites and studios are fully equipped with air conditioning, satellite TV, fully equipped kitchenettes, safety deposit boxes, direct dial telephone & hair dryers.